MBF Bioscience has done it again – another game-changing capability for bioscience researchers. This time, MBF is providing scientists with Biolucida™, the world’s first system that allows researchers around the world to access a full 3D digital representation of a microscopic specimen, and to look at any region of interest, at any focal plane at any magnification. The concept for Biolucida is simple. A researcher captures a 3D image from the microscope and uploads it to a Biolucida server. The researcher emails colleagues around the world to give them access to the image. They log on, and they can do all the viewing and analysis that they’d be able to if the specimen were sitting on a microscope in their own lab. They can look at and analyze any region of interest, at any focal plane, at any magnification, from anywhere in the world. Biolucida joins a group of microscopy 3D imaging tools that MBF has developed over the years, including Microlucida, for microscope control and 2D and 3D image capture, Stereo Investigator, the most widely cited system for unbiased stereology, Neurolucida, the leading tool for 3D reconstructions and analysis of neurons, and AutoNeuron which automatically detects and traces neurons in 3D. 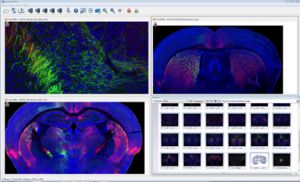 MBF Bioscience produces industry-leading microscopy imaging systems, including Neurolucida and Stereo Investigator. The award-winning company was co-founded in 1988 by Edmund and Jack Glaser. Previous post: Member Spotlight: Precision Bioassay, Inc.